Hi everyone! 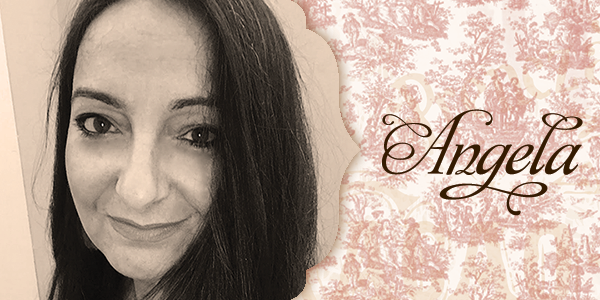 It's Angela here with you today. This time I'd like to show you what I've created with the new BoBunny stamps, particularly Rose Garden Stamp set which is absolutely amazing! A set of three cards that differ one from the other for colors and elements arrangement. 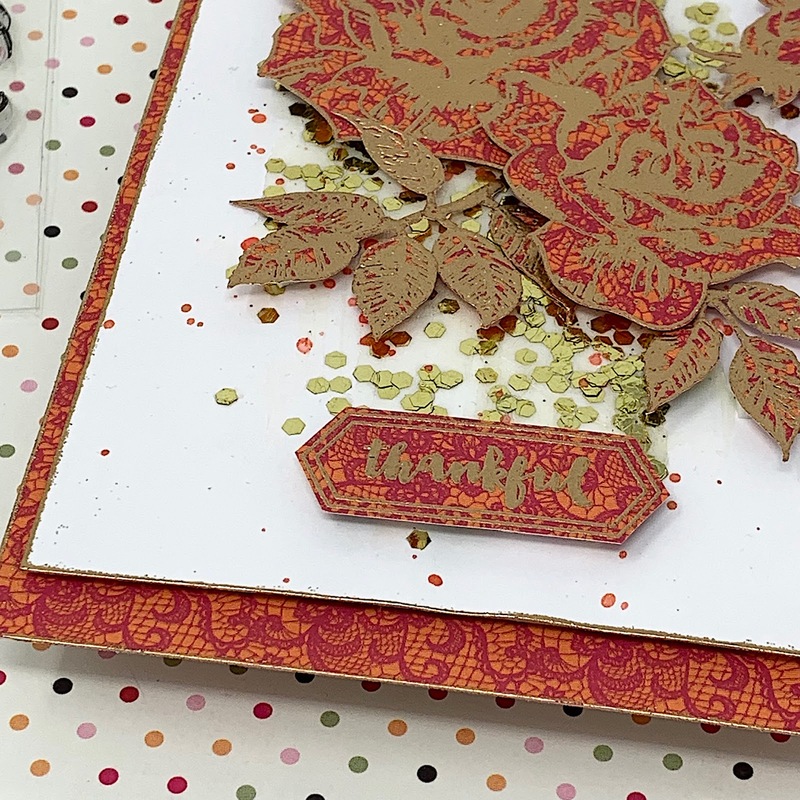 Instead of stamping on white cardstock I decided to stamp directly on the patterned papers of Sweet Clementine collection, which has several almost fade designs perfect for this technique. 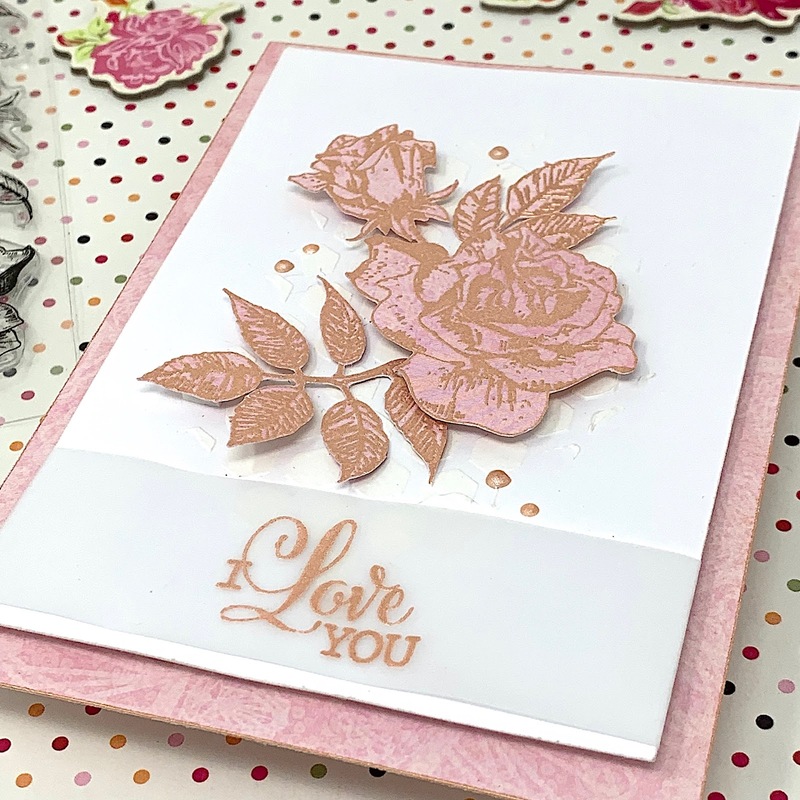 For the first card I went for a soft pink of Charisma paper and I stamped on it the roses with rose-gold embossing powder. Then, I fussy cut the flowers and the leaves and set them aside. I cut a piece of white cardstock, approximately 4 inches wide and 6 and 3/4 inches high and I added a touch of mixed media using a stencil and white gesso. 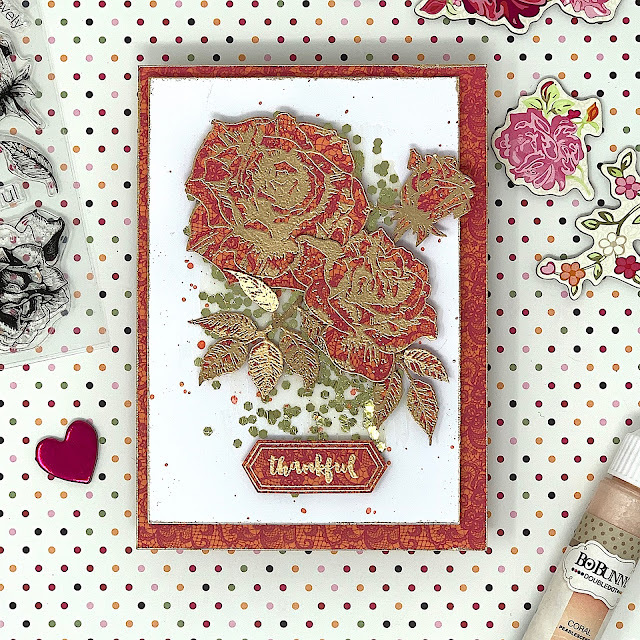 When it was dry, I adhered the flowers on the cardstock using dimensional adhesive and a few coral pearlescent drops. 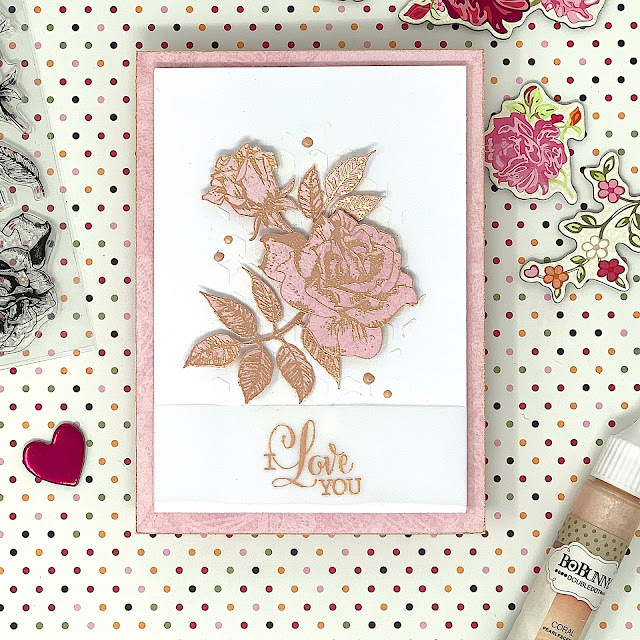 The sentiment is from the same stamp set and I stamped it on a strip of vellum with rose gold embossing powder. I mounted everything on a mat cut from the same Charisma paper and I embossed it along the outlines always in rose-gold. The second card has a more bright color. Here I chose the back of Sublime paper which has a pink lace design on an orange background. 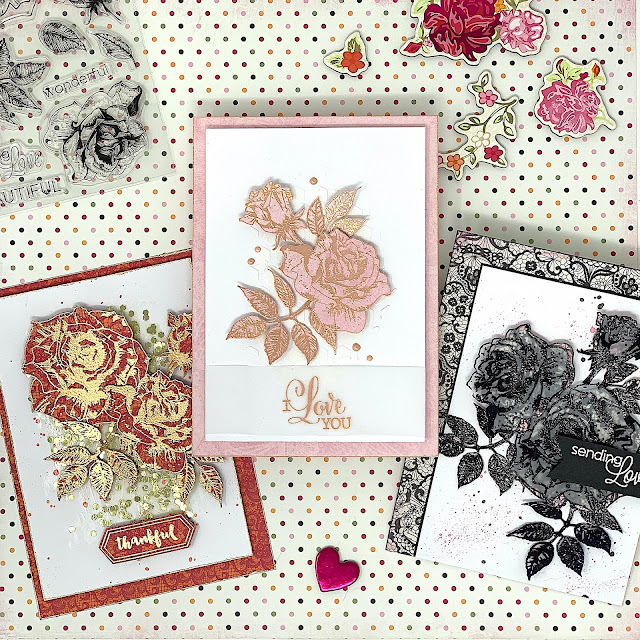 I stamped my flowers on it using gold embossing powder, fussy cut them and adhered on a white cardstock of the same size as before. Before adhering, I spread a thin layer of gold confetti paste. The sentiment here is from another stamp set, called Gratitude Stamp and it's stamped in gold embossing powder. Also here, to complete the card I gold embossed the outlines and voilà, the second card is done! The last card actually, is the first card I made. It's a bit different from the others. The patterned paper I chose for stamping the flowers is a bit busy, so I decided to stamp everything twice on vellum. 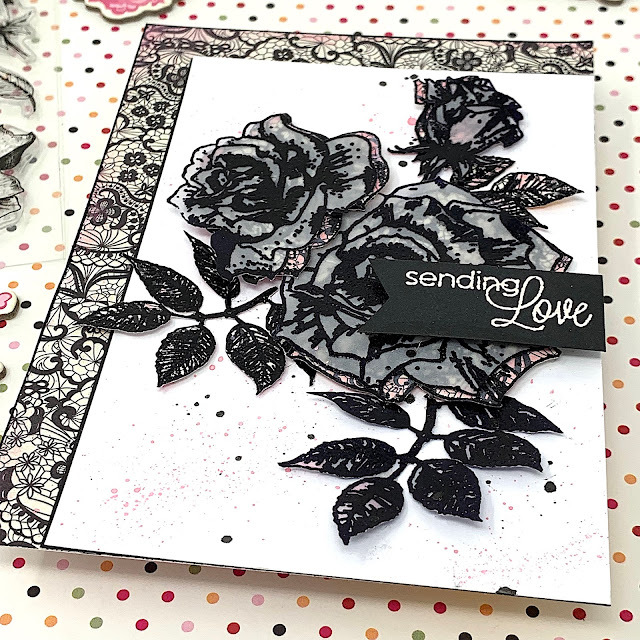 I used black embossing powder in both cases. I fussy cut the rosed and adhered the stamped on vellum onto the paper roses, keeping them not completely aligned. 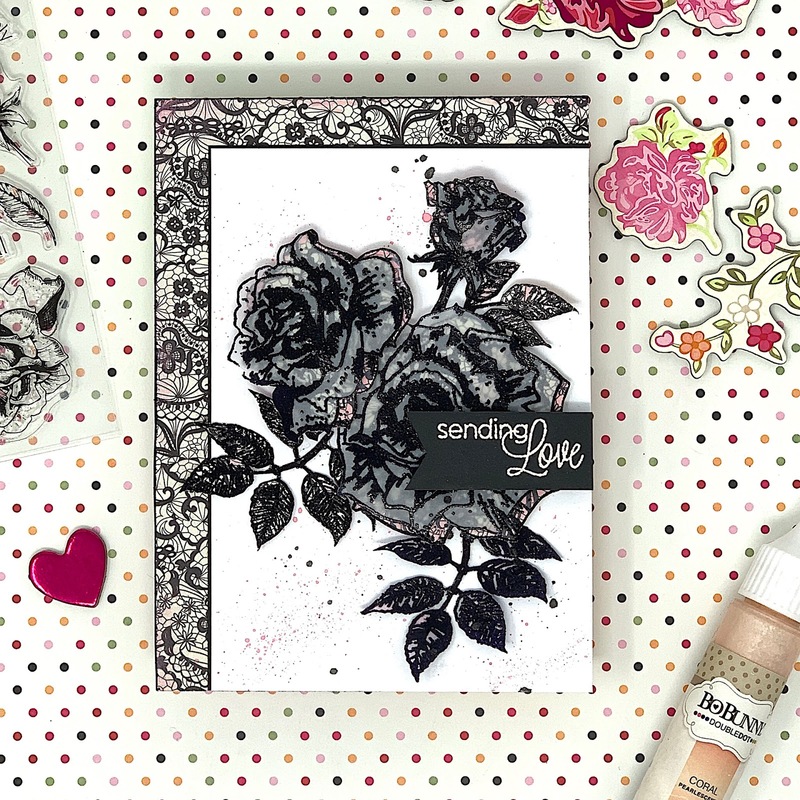 The black and white patterned paper, called Memories, has a touch of pink on the sides. So I decided to add a pit of pink on the flowers using my watercolors. Again, I mat the card on the same Memories paper, but changing the placement, so to vary the look. That's all for today my friends, I hope you enjoed my cards and you feel inspired to create your own.